Conagher is long, tall, and so dairy with fine skin and excellent ribbing. 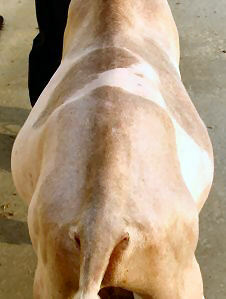 He is very reminiscent of the Me's Ranch Dutch Harlequin bloodline. Conagher has been 1st place every time shown and once senior GCH, BOB and BBIS as a 2 year old. As a 3 year old he was again GCH in one ring and Reserve in the next. 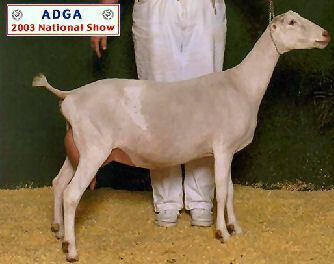 As a five year old in 2005 Conagher finished his championship with a Best of Breed win. His kids have taken the shown circuit by storm. His first 2 daughters born in 2001 were Jr. CH and BJDIS at their first shows out. Conagher's 5 year old milking daughter GCH Devonshire RC Sophia had a score of 5-04 FS 91 EVEE and was 4th place/3rd udder out of 56 at 2003 Nationals! Another yearling milker daughter LA'd 1-04 85 VV+V and was 2x Reserve Senior Champion as a yearling milker. 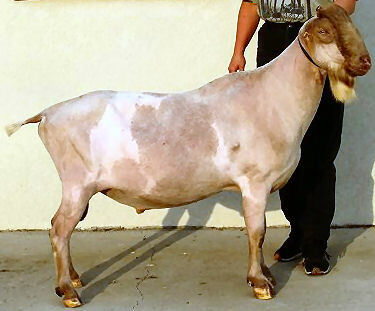 A daughter in the Lost Nation herd Twin Cypress OOHTC Carolina LA'ed FS 88 EEEV as a two year old first freshener in 2005 and a 3 year old daughter GCH Twin Cypress OOHTC Flutterby LAed 4-04 92 EEEE in APril 2007! In 2006 Conagher has earned his first + and is now a GCH buck! In addition to that he LAed 92 EEE as a six year old! We could not be more pleased with this fine boy! These are three first fresheners out of Conagher. The first is a 2 year old and the last two are yearlings. The last one is out of an Oberhasli doe.